J.D. Gibbs had been hand-picked by his father to run the organization, changed tires during the early seasons, had a brief stint as a driver, pushed for a pivotal switch to Toyota and discovered Denny Hamlin. He signed Hamlin to drive the No. 11, his number from his football days, and it is his name above the driver door on Hamlin’s car. J.D. Gibbs died last month following a long battle with a degenerative neurological disease and Hamlin dedicated this NASCAR season to Gibbs’ memory. 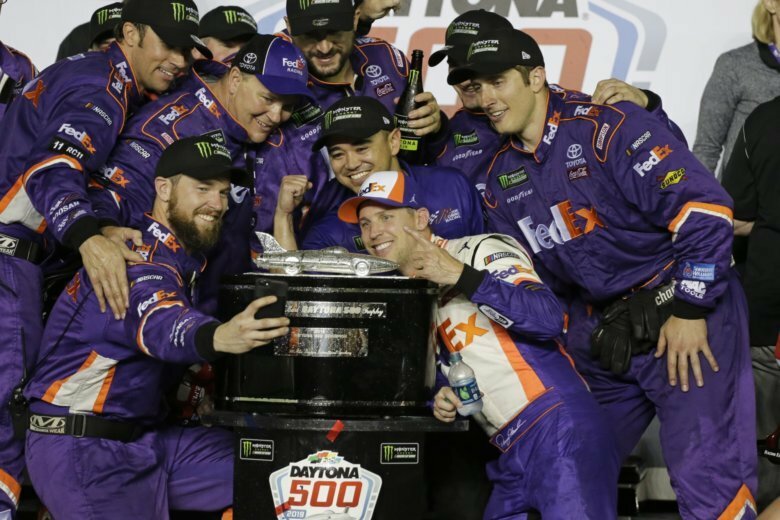 When Hamlin crossed the finish line Sunday night to win his second Daytona 500 in four years, Joe Gibbs could not hold back what the moment meant to him. A Hall of Fame NFL coach with three Super Bowl victories ranked JGR’s third Daytona 500 win as top. “It’s the most emotional and the biggest win I’ve ever had in my life in anything” Gibbs said. “J.D. built our race team, was the guy that ran day to day operations for 27 years. He invested his occupational life in our race team. It was the most important night in my occupational life. Hamlin led JGR in a 1-2-3 sweep of the podium in overtime and was met in victory lane by the entire Gibbs family, including J.D.’s widow and four sons.